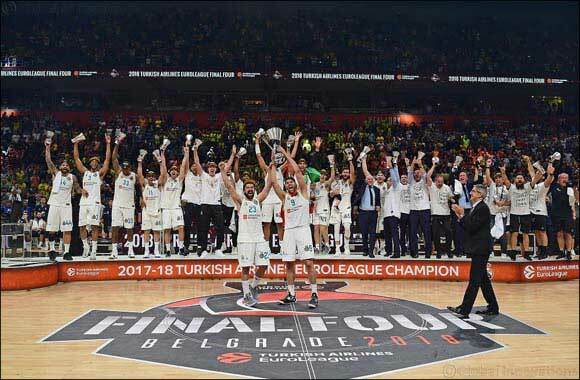 Real Madrid has become the champion team of the exciting Turkish Airlines EuroLeague Final Four 2018, following a decisive victory of 85-80 over its rival Fenerbahçe Doğuş Istanbul at Belgrade's Štark Arena. This win also stands for the 10th EuroLeague Championship of the Spanish representative. Dubai, United Arab Emirates -- May 22nd, 2018: The Final Four came head to head in Europe's highest-level basketball championship over the weekend at the Štark Arena, Serbia's largest indoor arena. And the new champion Real Madrid was crowned as the victor on Sunday 20th May in the final stage of the Turkish Airlines EuroLeague. Friday night saw the first games of the Final Four. Reigning champions Fenerbahçe Doğuş Istanbul and Žalgiris Kaunas played the initial semi-final game of this year' tournament at 18.00 (local time) followed by CSKA Moscow and Real Madrid at 21.00. Losing teams of these matches, Žalgiris Kaunas and CSKA Moscow then faced each other for the third place game within today at 17.00 with the Championship Game taking place between Fenerbahçe Doğuş Istanbul and Real Madrid at 20.00. As the home hub of Turkish Airlines, in 2017 Final Four, Istanbul has twice played host to the championship and for the 2018 Final Four, Serbia's capital was well placed to welcome the best in basketball. The evening culminated in Real Madrid triumphantly lifting the coveted Turkish Airlines EuroLeague 2018 trophy cheered on by the crowds and broadcast by more than 32 broadcasters across more than 175 countries. At the awards ceremony at the Palace of Serbia on 19 May, five of the biggest stars in the 2017-18 competition were announced; Nick Calathes of Panathinaikos Superfoods Athens, Nando De Colo of CSKA Moscow, Luka Doncic of Real Madrid, Tornike Shengelia of KIROLBET Baskonia Vitoria Gasteiz, and Jan Vesely of Fenerbahce Dogus Istanbul. In addition, the EuroLeague MVP, Luka Doncic of Real Madrid was awarded 1.000.000 Miles&Smiles Travel miles from the advantageous FFP of Turkish Airlines. As being sponsored by Turkish Airlines, the only airline that flies to more countries and international destinations in the world, Final Four championship again offered sports lovers around another unique environment and experience. In the true spirit of Turkish Airlines, ‘delightfully different' activities were performed by teams from Turkish Airlines and EuroLeague. This was also an opportunity to continue with initiatives carried out by OneTeam, EuroLeague's corporate social responsibility program which was created with the Turkish flag carrier airline's support in 2012. The EuroLeague Basketball was established in 2000 as the most important basketball competition in Europe, 2010 saw Turkish Airlines become the official title sponsor of the championship as well as sponsor of the final round. Turkish Airlines' commitment to the game continues, and sponsorship of the EuroLeague Basketball will proceed to run for the two more years until 2020.